Title: 'Anglia Regnum'. With Latin text on the verso. The outline and place names are taken from Speed with county boundaries marked and two finely engraved coats of arms of Great Britain and Ireland. 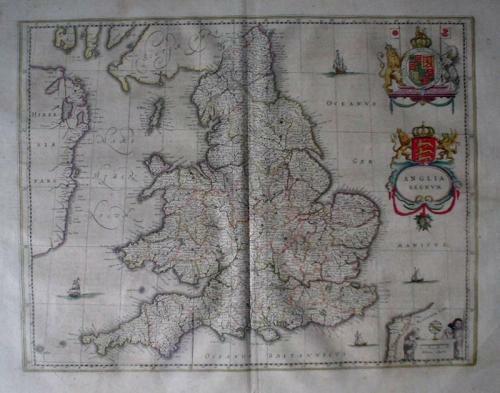 "Once again in advance of the Hondius-Jansson rivals, Willem Blaeu was the first to bring out a new map of England and Wales. The outline and place names are taken from Speed with county boundaries marked but no border figures. Decoration generally is kept to a minimum. There are two finely engraved coats of arms, of Great Britain and of England, surmounting the title cartouche; there are no heraldic shields on the land surface as appear on the similar map produced by Jansson in 1636. There is a single scale of miles and the map is not signed."